Presbyopia is the irreversible loss of the accommodative ability of the eye that occurs due to aging. Accommodation refers to the ability of the eye to increase its refractive power of the crystalline lens in order to focus near objects on the retina. The most significant decrease in accommodative power occurs in between the ages of 20 and 50. In the first two decades of life accommodative amplitude has been shown to be relatively stable in the range of 7-10 diopters. By the age of 50, accommodative amplitude has typically decreased to about 0.50 diopters. This decline occurs as a natural result of aging and will ultimately affect any person reaching advanced enough age. Despite its ubiquity, the exact mechanism behind presbyopia remains unknown. Presbyopia is primarily an inevitable, age-related condition and accordingly its prevalence in a given population is related to the percentage of individuals surviving to old age. Worldwide in 2005 over 1.04 billion people were estimated to suffer from presbyopia with around 410 million of them suffering from near vision loss due to lack of vision correction. 94% of those lacking proper correction were in developing nations. By the year 2020 the worldwide prevalence is expected to rise to 1.37 billion. The average age of those first reporting symptoms of presbyopia is between 42 and 44 years of age with a complete loss of accommodation typically occurring between the ages of 50-55 years. Although age is the primary predictive factor in the development of presbyopia, early loss of accommodative ability can be induced by certain systemic disease, medications, and trauma. It is also important to note that individuals whose occupations require extensive use of near vision often notice symptoms earlier than other similarly aged individuals. Gradual onset of blurred near vision is often the first presenting symptom of presbyopia. The severity of accommodative loss at the time of presentation varies based on the visual needs of the individual. Those who utilize near vision in daily activities frequently complain of impairment earlier. Other symptoms commonly experienced include squinting, headaches secondary to eye strain, increased light requirement, and need to work from progressively greater distances. Diplopia can also result from presbyopia and is thought to be associated with increasing exophoria and decreased vergence amplitude seen frequently in presbyopic patients. The underlying cause for the loss of accommodation in presbyopia has yet to be fully elucidated and remains a topic of controversy amongst the medical community. Models for presbyopia can be generally divided into two categories referred to as lenticular and extra-lenticular theories. Lenticular theories hold that presbyopia results from age-related changes in the lens, capsule, and zonular fibers. Implicated changes in this category include sclerosis of the nuclear lens tissue, decreased distance between ciliary muscle and lens equator, and decreasing elasticity of the lens capsule. Proposed extra-lenticular causes include ciliary muscle dysfunction, loss of elasticity in the posterior zonules or choroid, and even decreasing resistance of the vitreous humor against the accommodating lens capsule. Helmholtz: The classical theory of accommodation proposed by Helmholtz over 150 years ago states that the lens under resting tension is held relatively flat when viewing objects at a distance. During accommodation, the ciliary muscle contracts and moves both anteriorly and inwardly. This decreases tension on zonular fibers and, in turn, causes increased curvature in the elastic lens resulting in increased focusing power. According to Helmholtz, age-related hardening of lens tissue results in decreased elasticity and thus, decreased distortion of the lens during accommodation. Coleman: Also known as the catenary theory, Coleman proposed that the zonular fibers function like the support pylons of a suspension bridge and determine the natural curvature of the lens. That curvature is in turn modified by the opposing pressures in the anterior and posterior chambers. When the ciliary muscle contracts during accommodation, the curvature steepens, but a pressure gradient is also created between the two chambers causing increased curvature of the lens centrally and relative flattening in the periphery. Schachar: Schachar proposed an alternative theory of accommodation which suggested that, due to the presence and insertion points of equatorial zonular fibers, contraction of the ciliary muscle increases tension on the zonules and lens capsule, causing the characteristic lens shape seen during accommodation. Since the lens continues to grow equatorially throughout life while scleral dimensions remain relatively stable after the first two decades, the result is a gradual slackening of tension in the zonular fibers. The proposed etiology of presbyopia is therefore attributed to the increasing inability of the ciliary muscle to create zonular tension adequate to distort the lens. Corrected near and distance visual acuity testing allows for evaluation of a patients’ refractive error as well as their functional capacity at near distances. Uncorrected or under-corrected myopes will typically have less difficulty with near vision while the difficulties will be exacerbated in patients with uncorrected hyperopia. Refraction will provide a baseline distance correction to which the near value will be added to provide optical correction for presbyopia. Near lens prescription can be determined by adding plus power over the distance correction until clear near vision is achieved. Performing this monocularly will yield a higher value by eliminating variation caused by convergence accommodation. Near retinoscopy will provide an objective measurement of the required optical power for clear near vision. Intermediate distance testing may also be warranted for patients with mid-range visual needs (ie. computers) and advanced presbyopia. The safest and least invasive management of presbyopia consists of corrective glasses lenses either as a separate set of reading glasses, contact lenses, bifocals, or progressive lenses. There are however, a growing number of presbyopic patients who desire to remain independent of glasses and thus, many surgical methods of compensating for near vision deficits in presbyopes have become available. More commonly this has been attempted by manipulation of passive optical factors without restoring the ability to actively accommodate. Such methods effectively increase the depth of field of the eye at the cost of contrast and visual acuity. Examples of these treatments are monovision, multifocal lenses, and corneal inlays. Both monovision and multifocality can be accomplished via the surgical implant of specific IOLs or various forms of refractive corneal surgery (LASIK, PRK, conductive keratoplasty, or intracorneal femtosecond laser). These treatments are essentially treating the symptoms of presbyopia without addressing the underlying deficit. Boyd K, Pagan-Duran B. Presbyopia. American Academy of Ophthalmology. EyeSmart® Eye health. https://www.aao.org/eye-health/diseases/presbyopia-lista. Accessed March 22, 2019. American Academy of Ophthalmology. Refractive Management/Intervention: Presbyopia Practicing Ophthalmologists Learning System, 2017 - 2019 San Francisco: American Academy of Ophthalmology, 2017. ↑ 1.0 1.1 1.2 1.3 1.4 1.5 1.6 1.7 1.8 1.9 American Optometric Association. Care of the patient with presbyopia. St. Louis (MO): American Optometric Association; 2010. ↑ Anderson HA et al. Minus-Lens–Stimulated Accommodative Amplitude Decreases Sigmoidally with Age: A Study of Objectively Measured Accommodative Amplitudes from Age 3. Invest. Ophthalmol. Vis. Sci. July 2008 vol. 49 no. 7 2919-2926. ↑ 3.0 3.1 Holden BA, Fricke TR, Ho SM, Wong R, Schlenther G, Cronjé S, Burnett A, Papas E, Naidoo KS, Frick KD. Global vision impairment due to uncorrected presbyopia. Arch Ophthalmol. 2008 Dec;126(12):1731-9. ↑ Kleinstein RN. Epidemiology of presbyopia. In: Stark L, Obrecht G, eds. Presbyopia: recent research and reviews from the third international symposium. New York: Professional Press Books, 1987:12-8. ↑ 5.0 5.1 5.2 5.3 5.4 5.5 Croft MA, Glasser A, Kaufman PL. Accommodation and presbyopia. Int Ophthalmol Clin. 2001 Spring; 41(2):33-46. ↑ Patorgis CJ. Presbyopia. In: Amos JF, ed. Diagnosis and management in vision care. Boston: Butterworths, 1987:203-38. ↑ Wick B. Vision training for presbyopic nonstrabismic patients. Am J Optom Physiol Opt. 1977 Apr; 54(4):244-7. ↑ 8.0 8.1 Goldberg DB. Computer-animated model of accommodation and theory of reciprocal zonular action. Clin Ophthalmol. 2011;5:1559-66. ↑ Glasser A, Kaufman PL. The mechanism of accommodation in primates. Ophthalmology. 1999 May; 106(5):863-72. ↑ 10.0 10.1 10.2 Glasser A, Campbell MC. Presbyopia and the optical changes in the human crystalline lens with age. Vision Res. 1998 Jan;38(2):209-29. ↑ 12.0 12.1 12.2 Coleman DJ. Unified model for accommodative mechanism. Am J Ophthalmol. 1970;69:1063–1079. ↑ 13.0 13.1 Coleman DJ, Fish SK. Presbyopia, accommodation, and the mature catenary. Ophthalmology. 2001 Sep;108(9):1544-51. ↑ 14.0 14.1 14.2 Schachar RA. The mechanism of accommodation and presbyopia. Int Ophthalmol Clin. 2006 Summer;46(3):39-61. ↑ 15.0 15.1 Santaella R, Afshari N. Presbyopia-correcting intraocular lenses: 'one lens does not fit all'. Curr Opin Ophthalmol. 2010 Jan;21(1):1-3. ↑ 16.0 16.1 16.2 16.3 Torricelli AA, Junior JB, Santhiago MR, Bechara SJ. 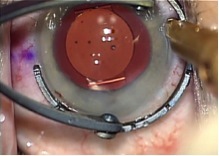 Surgical management of presbyopia. Clin Ophthalmol. 2012;6:1459-66. ↑ 17.0 17.1 Lichtinger A, Rootman DS. Intraocular lenses for presbyopia correction: past, present, and future. Curr Opin Ophthalmol. 2012 Jan;23(1):40-6. This page was last modified on March 22, 2019, at 14:15. This page has been accessed 42,191 times.